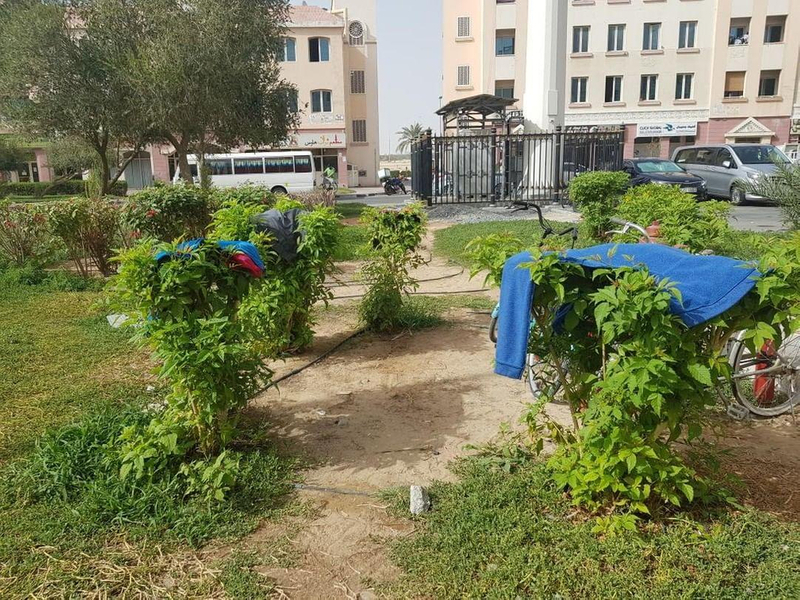 Dubai: Living in International City, Dubai for more than two years, Alexander Golub started noticing something strange – some residents are drying their laundry in public areas. Driving around the country-themed residential neighbourhood, one is likely to see different articles of clothing hanging from balconies, plant fencing, grass patches and even roundabouts. Residents have repeatedly raised their concerns and according to them, overcrowding is one of the main reasons of the issue. Those who choose to do it confirmed that the lack of space because of overcrowded apartments is why they are resorting to drying their clothes elsewhere. 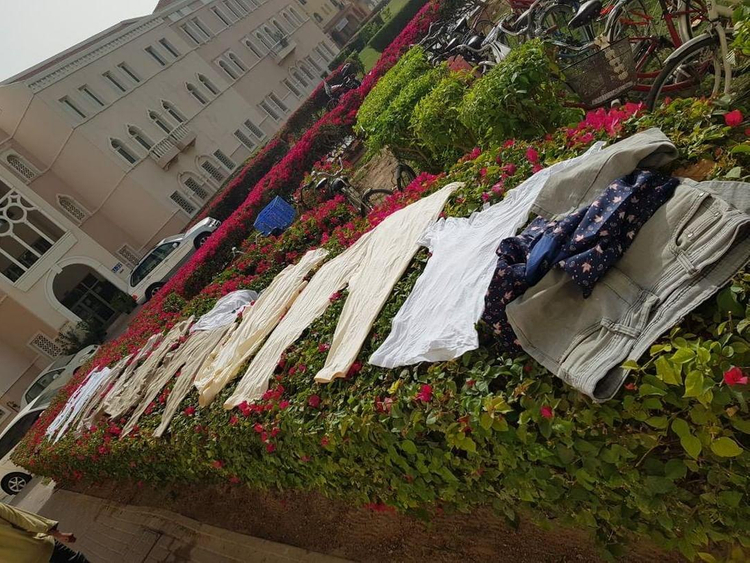 “I live with seven other people in my one-room apartment, there’s absolutely no place to dry my clothes,” said Zabeel Ullah, an International City resident who works at the nearby Al Aweer Central Fruit and Vegetable Market. Many of the residents in these overcrowded flats also work at the market. 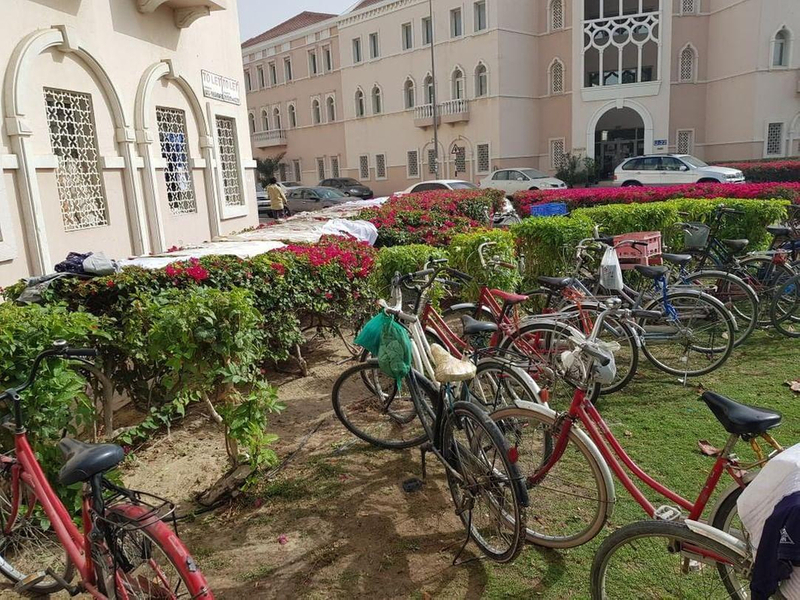 Bicycles are their preferred mode of transport to get around the area and it has given birth to another issue – hundreds of cycles parked around the vicinity. A number of residents pointed out that authorities have regularly tried to address the situation by confiscating clothes and bicycles as well as imposed fines against overcrowded flats but the problem seems to persist. Golub and his family of four have seen this happen over two years now. “This badly affects the look of the area and city, something needs to be done,” he said. The family initially moved to the area because of relatively low rents and other facilities. “I looked at the price, architecture and greenery around the area but didn’t notice the issue of overcrowding. I was surprised once I moved in,” he said. 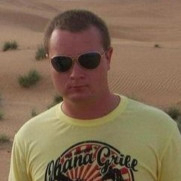 Currently working as an electrical engineer, the Ukrainian national moved to the UAE in 2005 and has lived in multiple areas around Sharjah and Dubai before settling in International City. “I had not faced the same issues in places I lived before,” Golub said. The 36 year-old added that strict action must be taken against those who repeatedly break rules of conduct. “People only understand actions and some action needs to be taken,” he said. People only understand actions and some action needs to be taken. Another resident of the area, Shinod Kumar had similar concerns. “There are sometimes clothes being dried at the middle of roundabouts. Security officials around the city are working hard but people keep continuing to do it [hang clothes]. Something else must be done,” he said. Gulf News approached Nakheel for a comment and they immediately responded. “We are aware of this issue, have deployed teams to take the appropriate action and have seen a significant reduction in such incidents as a result. We will continue to take action on any additional incidents as necessary,” said Rebecca Rees, senior manager of media relations and communications.